Loom Knitting Patterns are reasonably hard to come by. If you buy yourself a loom you might find some basic patterns are included in your with purchase, but when I say basic patterns, that is exactly what I mean. You will find many free patterns online for hats but really they are all pretty much the same and again really basic. Good for raw beginners but they do not present much of a challenge for someone who has already made a hat or two. For those of you who are a bit more adventurous, remember that many of your normal knitting patterns can be converted to loom patterns. Patterns for bulky knits are better as most looms are designed to work best with bulky yarn or twin strands but if you have a pattern for a 12 or 16 ply there is no reason why you couldn't knit it on a loom instead of on knitting needles. 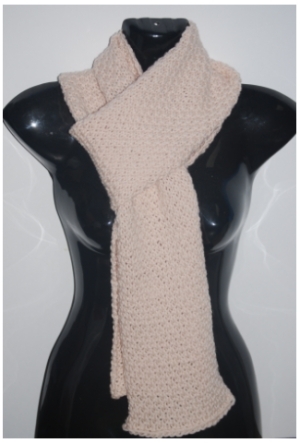 At the moment, I do not have many knitting loom patterns on the site, and you have a choice of a scarf or a scarf! But I will be adding more patterns as I created them, so do bookmark this page and come back from time to time to check for updates! 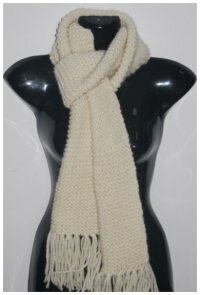 Are you looking for a knitting loom garter stitch scarf pattern that you can make on your loom? If this is your first knitting loom project, this is a reasonably easy scarf to knit. Unlike normal knitting, on a loom garter stitch is made by doing one row of knit stitches followed by one row of purl stitches. If this is your first knitting loom project, this is not a pattern that I would recommend. Providing you have mastered doing knit and purl stitches on your loom, this pattern is achievable, but it will take a bit of care to make sure that you have done your knit or purl stitches in the right place! I designed the scarf and I had a bit of trouble keeping the pattern correct! 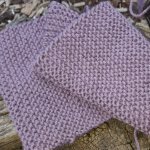 Having said that, the stitch pattern on this scarf is very effective and might just provide you with a bit of a challenge. This ebook is filled with patterns for sweaters for the baby, toddler and small dog. There are adorable booties, super warm slippers, popular doll clothes and more. This eBook was clearly written by someone with a true passion for loom knitting and I highly recommend it. All items are made on the easy to find inexpensive, Knifty Knitter Round Looms. For more information on this ebook click here! 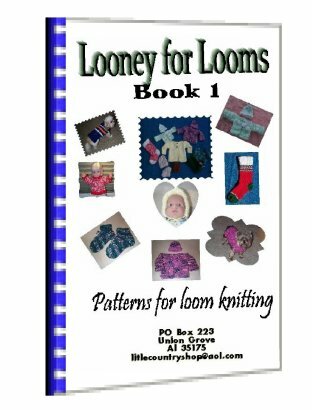 Amazon.com has a reasonably good selection of pattern books for knitting looms. Just click on any of the links below to find out more about any of the books I picked out. If none of these appeal to you, click anyway and do a search for loom knitting patterns on Amazon.com's site for one that does.